A big moment for Decatur’s big property with big potential is here. The city has announced over on the Decatur Next website that they’ll be unveiling the first draft for the United Methodist Children’s Home 77-acre property next Monday, April 30th from 6p-8p in the Ebster Rec Center gym. The draft comes after two months of kickoffs, civic dinners and workshops. Should be very interesting to see what the community has come up with! As you may remember, in August of last year, the City of Decatur completed its purchase of the 77 acre United Methodist Children’s Home on South Columbia Drive. I am excited to announce that the time has come for the community to come together and create a vision for this property. On Sunday, Feb. 11 we will host a kick-off celebration and visioning workshop from 1-5 p.m. at the Children’s Home location (500 South Columbia Dr. Decatur, GA 30030). You are invited to join us as we imagine the possibilities. Updates and workshop schedules will be posted on Decaturnext.com and via our social media channels. Feel free to contact me if you have any questions. 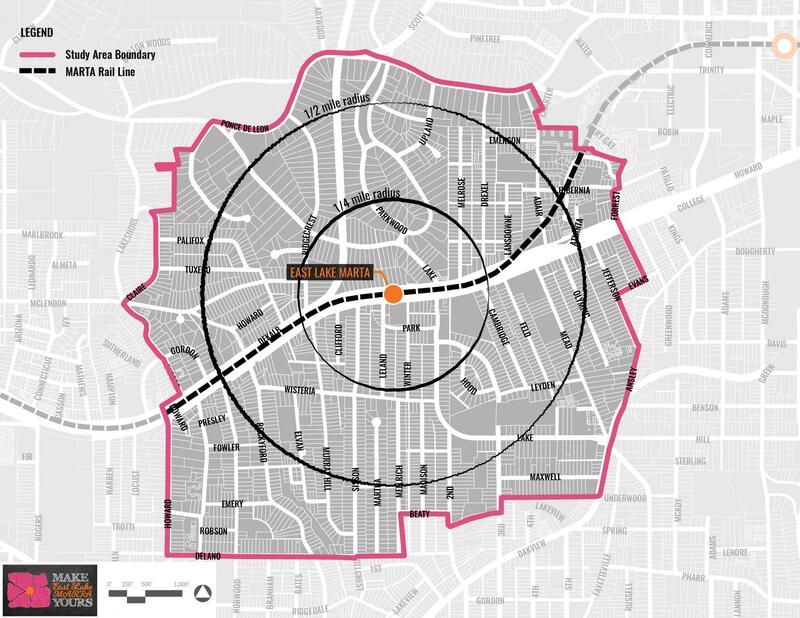 MARTA and the cities of Decatur and Atlanta have been soliciting feedback from stakeholders, regarding the development around and within the East Lake MARTA Station for over two months. Now it’s time to showcase their ideas and get your feedback! Take the survey HERE and see the proposed concepts. The stakeholders of three different municipalities, one transit system, and a variety of businesses and environmental interest groups have come together to develop a vision for the place they share – the East Lake MARTA Station. Your input over the last two months and six events generated several concept diagrams for the East Lake MARTA Station study area. Now’s the time to share, once again, your feedback on each of the concepts for the north parking lot, the south parking lot, potential future AT&T redevelopment, and street improvements for East Lake Drive, College Avenue, and Park Place. You’ll want to allow 15-20 minutes to complete the survey that can be found here, http://www.surveygizmo.com/s3/4037001/ELMConcepts. Whatcha all think? The actual redevelopment isn’t expected to begin for another 3-5 years, as MARTA works to complete development at other stations around Atlanta. One of the biggest announcements is that Pope & Land recently purchased the 1972 glass office building adjacent to the Old Courthouse on the Square. The purchase includes the parking deck behind the building and the retail/commercial spaces below it. Pope & Land is a local Atlanta area commercial developer and property owner with a long history in downtown Decatur. They developed the One and Two Decatur Town Center office buildings in the 1980s, which were the first commercial buildings constructed after the adoption of the 1982 Town Center Plan. They are working on plans to upgrade the exterior of the building and create a stronger retail focus along Ponce de Leon Avenue. But the really good news is that they have disconnected the fake bird noises that once sounded from the top of the building. If you have been in Decatur for a few years, you know what we are talking about! The new owners and their design team are working on ideas to bring more life to the plaza area in front of the building and create a stronger connection between the plaza and the courthouse square above it. Plans also include improving the exterior of the parking deck. Thanks to the interest and support of this new owner, this building will soon become more a part of the W. Ponce de Leon corridor and create a stronger pedestrian connection between the square and the retail and restaurant shops to the west. Look for the Root City pop-up holiday shop in the former Art Institute gallery space through the end of the year, thanks to the support of these new building owners. We have long referred to this structure as the “Birds from Hell” building, thanks to the angry, recorded raptor calls that emanated non-stop from the roof. It was supposed to help with birds flying into its endless expanse of glass. We have long wished they would stop. Finally! 9 years later we get our wish! Decaturish has a summary of the property owner’s plan to build a 232 unit mixed use development at the current Bank of America site at the corner of Church Street and Commerce Ave. The site plan above, from the city commission agenda for tonight’s meeting, give a sense of how new buildings will be situated on the lot. The developer is requesting a lifecycle density bonus, hence it’s appearance on the commission’s agenda. The Planning Commission has already approved the plan that would add 29 lifecycle dwellings to the property in exchange for an allowance of additional density at the site. This almost happened back in 2012. Now it sounds like it’s finally going to get off the ground. Plans are moving forward for the redevelopment of the Bank of America site in Decatur. This critical gateway to downtown will include a new, smaller building for Bank of America, and residential and retail uses fronting Clairemont, Commerce and Church Street. Parking for the project will be underground and the developer is contributing property along Commerce Drive to allow for the extension of the planned bicycle track and wider sidewalks. Downtown Decatur is getting another hotel. Anyone who has tried to book a room recently at the Decatur Marriott Courtyard knows how frequently it is full. Decatur’s proximity to downtown Atlanta, Emory and CDC, easy access to the Atlanta airport on MARTA and the ability to walk to a number of local retail and restaurant options continue to attract a growing number of visitors to our city. The new 132-room Hampton Inn and Suites will allow Decatur to host more medium-size conferences at the city-owned conference center. The conference center has enough meeting space but there aren’t enough available hotel rooms to allow it to be used to its full capacity. Building permits for the new hotel have been approved and construction should begin this month. City arborist Kay Evanovich worked closely with the hotel owner to arrange to have 17 trees relocated from the hotel site to Glenlake Park. Next time you visit the park, look for the new grove of trees located in the upper area of the park near the soccer field.